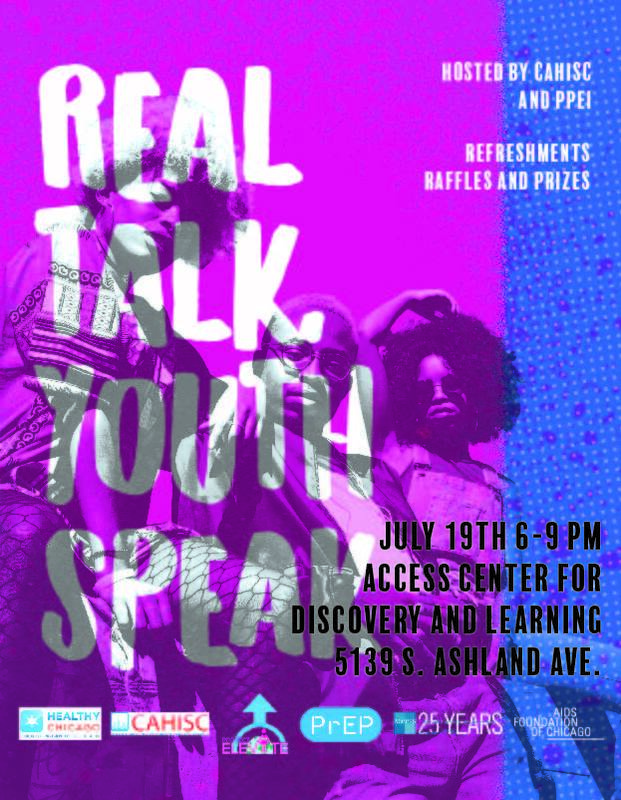 Chicago — “Real Talk, Youth Speak,” a free community input forum for Chicago area youth, will be convened from 6 to 9 p.m., July 19, at the Access Center for Discovery and Learning, 5139 S. Ashland Ave., Chicago. The forum is a premiere event that brings together diverse youth to form a cross-sector of feedback on health issues in the Chicagoland area. The forum aims to create an environment in which youth from diverse backgrounds can cross-pollinate ideas, share insights, and gain new perspectives to create actionable outcomes to push health care access forward. “Real Talk, Youth Speak,” is sponsored by Access Community Health Network, AIDS Foundation of Chicago, and Chicago Department of Public Health and will be hosted by the Chicago Area HIV Integrated Services Council and its Primary Prevention and Early Identification Committee.